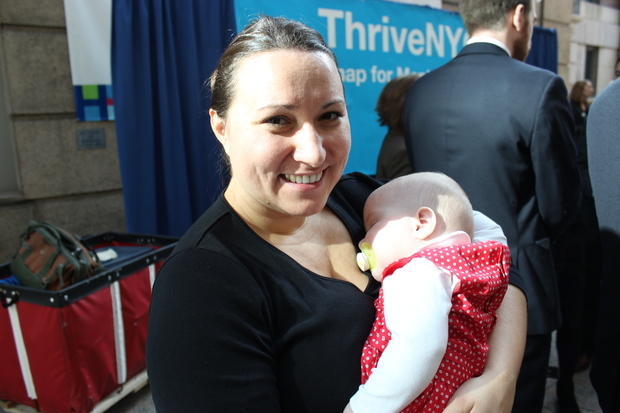 KIPS BAY — When she became pregnant with her first child, Martha Duff, 35, didn't know it came with the expectation that she would be happy all the time. "People would ask me how I was doing and get upset even when I said 'so-so," Duff said Tuesday while holding her 6-month old daughter Margot. "Everyone kept telling me, 'you should be happy, you're having a baby'." But Duff, who lives in the East Village, was experiencing a hormonal imbalance due to her pregnancy that was causing her to suffer from depression. Her doctor referred her to Bellevue Hospital where she has seen a psychiatrist for the last year. "I was a happy person before I became pregnant but when I first came here I felt there was a cloud over me," said Duff who declined to take medicine out of safety concerns for her baby and stuck with therapy. "Now I'm the happiest in the world." As part of an overhaul on how the city handles mental illness, more mothers like Duff will now be screened for maternal depression. The effort is part of ThriveNYC, a "roadmap" for how the city wants to deal with mental illness, an initiative being led by First Lady Chirlane McCray. "Asking for help during what is considered one of the most joyous periods in a parent’s life can be daunting," McCray said at Bellevue Hospital. "No woman wants to be a bad mother. But depression, coupled with the stigma and fear of being labeled a bad mom, can keep women from reaching out for the help they need. That is why universal screening is essential," she added. At least one in 10 women will suffer from depression during pregnancy, known as maternal depression, or after giving birth, known as postpartum depression. In New York City, that amounts to 10,000 women per year. But studies have found that effective treatment could prevent 3,000 women per year in New York City from suffering from postpartum depression. New York state's Medicaid system began reimbursing doctors for performing maternal depression screenings last month. Dr. Ram Raju, president of NYC Health + Hospitals, formerly known as the Health and Hospitals Corporation, said the screening is not currently done on a consistent basis. "A lot of doctors really don't want to talk about it. They want to look at the woman's physical well-being and go on to the next," said Pam Brier, President and Chief Executive Officer of Maimonides Medical Center who attributed the behavior to the stigma associated with mental health. The effort will teach doctors "how to ask the question and then get people into treatment," Brier added. Under the city's efforts, all NYC Health + Hospitals and Maimonides Medical Center in Brooklyn have committed to achieving universal maternal screening for depression and connection to treatment within two years. The two entities perform 25 percent of all deliveries in the city. At the same time, the Greater New York Hospital Association will launch a group of participating hospitals with the same goal of universal maternal screening for depression. "Our expectation is that we will have other hospital systems sign on very quickly and work together, learning from the experience of Health + Hospitals and Maimonides," said Deputy Mayor for Strategic Policy Initiatives Richard Buery. No timeline for 100 percent maternal screening was given. McCray said she expects the full, long-awaited ThriveNYC plan to be released in "just a few weeks." She said this effort fits in with the plan because one of its most important principles is early action. "We know that if we act early that we can prevent more serious mental illness from developing along the way," said McCray. "We need to make sure that mental health is not sidelined and put away from physical health." Duff said she's happy that other new moms will have an easier time getting the help she's found. "I know women are embarrassed and ashamed to talk about this during pregnancy but if we shed light on this issue and say this is normal, more women will be able to open up to help," Duff said.